Though is quite pretty, bananas are my kryptonite. However, I do make a datenut bread weekly. I never tire of it. So cute that Kendall was dismayed about no leftovers – a girl after my own heart. This looks fantastic, mushy middle and all! I’ve been wanting to incorporate more dates into my baking – this looks like a good start. Next time we get together I will bring you some of my frozen banana stash. I just tossed a bag last week that had been in the freezer for months. Oliver is an intermittent banana lover…….one week he polishes off 7 in 5 days. The next he doesn’t want to touch them. (Jackson has never been a fan). I always have a stash in the freezer and rarely run dry. 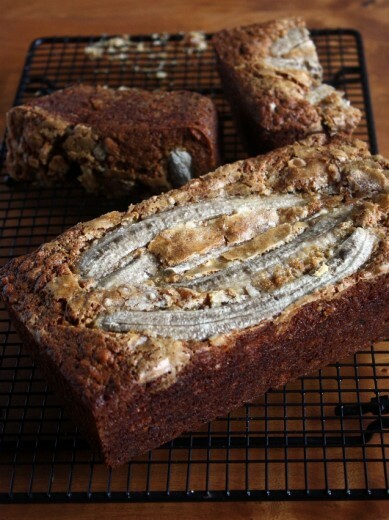 BTW Cooks Illustrated’s Best Recipes has an excellent banana bread recipe. Amazing, the difference the two pans made! Wouldn’t have thought that would happen. Oh well…. This looks great and I love the idea of the bananas on top. I’d hate to cut into it! I always have a stash of bananas, because I buy a big bunch every week, and the wee Nuni gets fussy when they get brown, so I pop them in the freezer. This looks fantastic, too — I love dates. 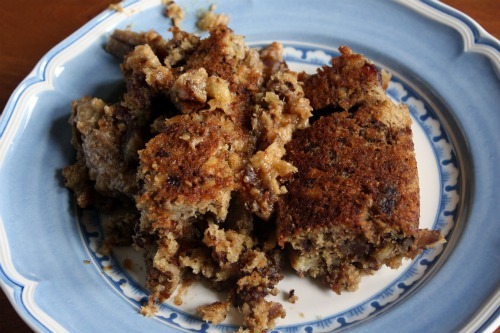 This banana bread version sounds really good, the next time I have a bowl full of old bananas I’ll make it. And you’re little guests sound adorable! It must have been hard to send them off empty handed! 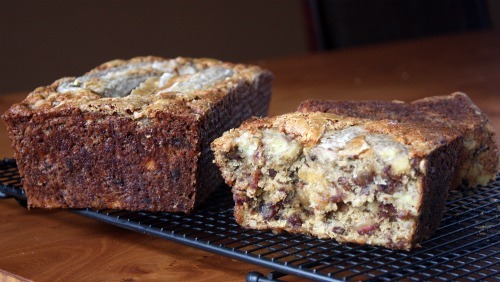 my sisters and I are baking date nut bars this minute…we are bookmarking this recipe, it looks divine! Dates are a family favorite! We ALWAYS have ripe bananas around so you can definitely have some of ours. I’ll just fed-ex them. Weekly. I only like them when they are a hint past green, so after that, they are totally banana bread material. Now perhaps they shall be banana CAKE material. Maybe I’ll still call it banana bread so that I can eat it for breakfast. Yes, that seems just about right. You can certainly have some of my stash Dana. I have plenty of banana torpedos in the freezer. I will trade them for a slice or two of your banana date cake. Dana – you can have some of the bananas from my freezer stash anytime. Our boy runs hot and cold on food items so the stash gets built up whenever he’s having a “I don’t like bananas week”. Lately tho’ my husband has been the one consuming 3 + per day and I’ve been making my weekly apple (or pear) banana muffins with bananas from the bowl. This looks intriguing and shocking about the difference in the loaf tins. I might leave off the banana slice topping in case the boy was having a “not eating banana” week. My loaf cakes turn out like your disaster one sometimes. I try to take cryptic photos of the slices and hope that other people don’t suffer the same fate! Interesting that you attribute it to your loaf pan – mine is a cheapo and 100 years old too. My loaf pans are older than I am so I’m hoping it’s the old ones that pulled you through. 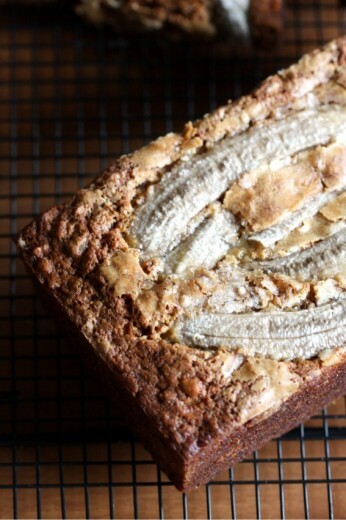 I hate bananas but love banana bread and I’m sure my husband would love these. Loved this recipe. Made a double batch with raisins instead of dates and put in a bunt pan! It made my house smell great and tasted just as good! Oh increased oven to 350. Time was still 1hr. Enjoying the blog-Thank you!